This is just a quick little post to show you all a technique for making your serged edges look crisp, clean, and professional. I don't know about you, but I LOVE a serged edge on my seams. 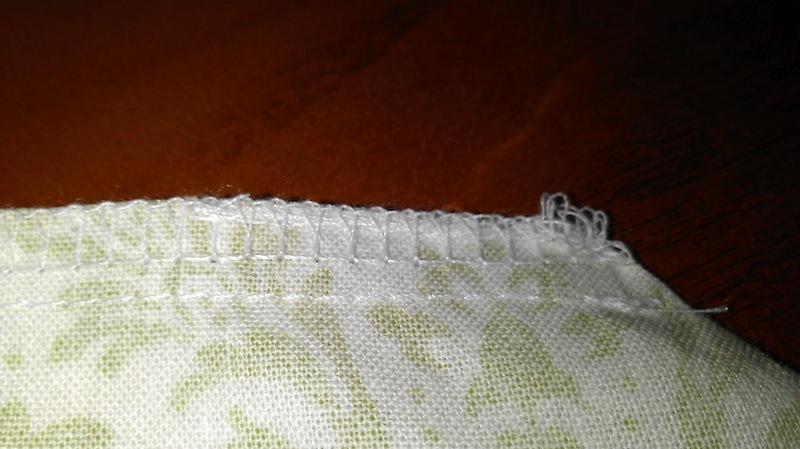 I love that my seams don't ravel, and that they are small and tidy looking. I really detest that homemade look that comes along with unfinished seams. 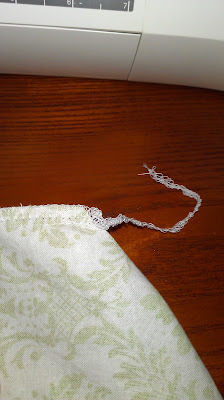 However, for a long time, I did not like the tails left behind on my serged edges. I didn't know what to do about them, because I knew they had to be left there so the stitches wouldn't come out, but they took away from my otherwise professional finish. Anyway, here is this super-simple trick to get rid of those ugly tails! All you need is a yarn needle. Thread the leftover tail through the eye of the needle. 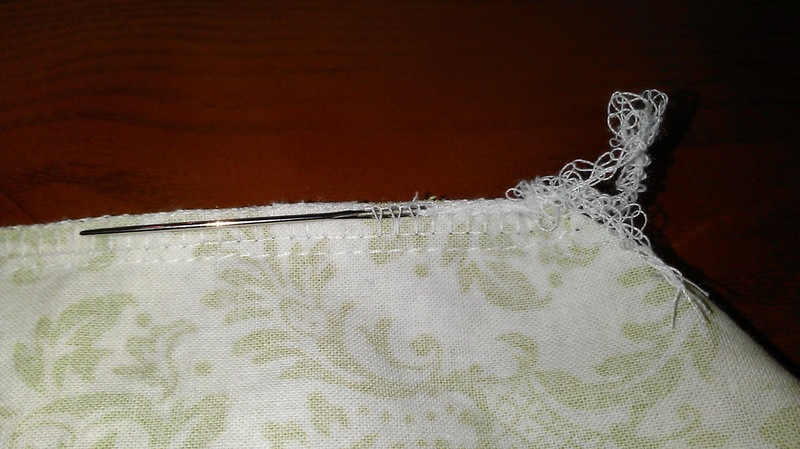 Thread the needle back through the stitches closest to the edge of the fabric. 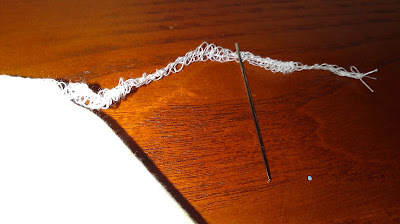 You only need to go back about an inch or so, at which point you can start leading the needle back out from under the stitches. Pull the tail all the way through. 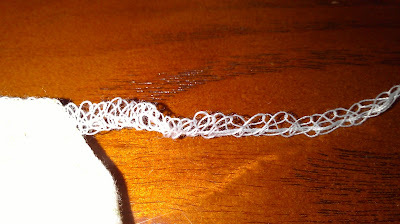 Then, just clip off the tail at the point where it emerges from underneath the stitches and voila! You have a clean finish with no annoying tail. Tip: The tail should just slide right under the other stitches. 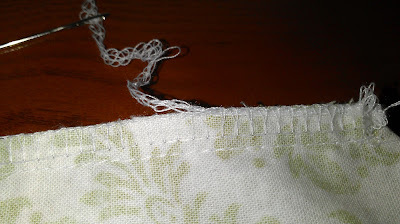 If you are having a hard time pulling the tail through the stitches, your threads are probably too "bunched up". Just grab the tail and ease the fullness out into a longer, thinner chain. In the picture below, you can see the part of the tail on the left has the loops of thread very close together and piled on top of each other. The right part of the chain has been smoothed out. 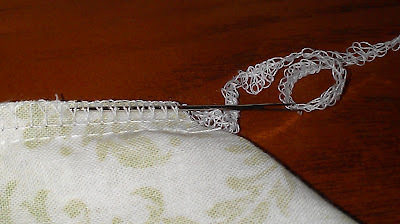 You want your tail to look more like the side on the right before you feed it under the stitches. Enjoy your crisp and clean serged edges!